Can Jurgen Klopp make Liverpool the Premier League team of the future? Can Jürgen Klopp make Liverpool the Premier League team of the future? THERE WAS A REDOUBTABLE AURA surrounding Jürgen Klopp as he arrived in England to replace Brendan Rodgers as Liverpool manager. His rambunctious presence jolted the media abuzz, his hysterical bursts of laughter and cheerful nature had journalists on their toes, eager to keep up with the unpredictable rhythm of the German’s oratory style. Not since José Mourinho’s cocky first Premier League steps have such languorous gazes been directed in the way of a manager. Even Klopp’s slightly limited English couldn’t avert the constant stream of public focus. While he scratched his head and stumbled for words his interviewers waited with patient expectancy, transfixed by his confused look, desperately eager to capture his next sound bite. There was a premature halcyon glow about the whole thing, a readiness to listen reserved only for someone who brings with them an iconic status. After a succession of draws slightly tempered this general enthusiasm, stunning away victories over Chelsea and Manchester City acted as a form of validation, though this proved ephemeral. Before long reality set in as English football gained renewed understanding of the fact that while Klopp is good, he isn’t an omniscient being. And – inevitably given the amnesiac tendencies of modern Premier League football – it was only a matter of time before aspects of his famed persona became a target for ridicule, before his voracious touchline energy stepped over some invisible line, going from endearing mark of shared passion to grating, overly-exuberant quirk. After a heated, last-gasp 2-2 draw at home to West Brom, Klopp seemingly crossed that line, with detractors guffawing at his post-match actions. At the final whistle, he had gathered his players, encouraged them to link hands and led them towards the Kop, where they all raised their arms in salute to the vociferous crowd that had urged them on to a 95th minute equaliser. To some, the gesture seemed absurd. Their argument was that a draw with West Brom at Anfield was not the time or place for such an act. This criticism missed the point. Klopp has an acute sensibility for building positive relationships with players and fans and his post-game salute was the latest example of him attempting to design a connection at his new club. He forged a strong bond with supporters of the teams he previously managed – Mainz and Dortmund – and this was just one element of his assault on the feelings of Liverpool fans. Klopp is not ‘one of the lads’, nor is he someone in pursuit of fulfilling English managerial stereotypes. In short, he isn’t trying to fit in, and the opinions of outsiders are not a priority. His boisterous behaviour in the aftermath of the West Brom game was a moment in and of itself, isolated from the result, league table or any other tangibly attachable form of meaning. It had far more to do with emotion. Over a quarter of a century has passed since Liverpool last lifted the title. Back then it even had a different name: the English First Division. Despite that triumph in 1990 being the club’s 10th championship in 15 years, the country’s footballing landscape was changing. Sir Alex Ferguson was in the process of weathering his own personal storm at Manchester United and would, over the next two decades, build a dynasty fuelled by a vigorous desire to overthrow Liverpool. The Premier League would come into being for the 1992-93 campaign, Ferguson’s Manchester United would win it to obtain their first league title in 26 years, and 12 more championships would be added in the ensuing decades as the fiery Scotsman fulfilled his ambition of “knocking Liverpool right off their f***ing perch.” By the time he retired in 2013, Liverpool had been relegated to the backwaters of Premier League title contention, able to muster a challenge only on the rarest of occasions. The tables could not have been more decidedly turned; Manchester United had overtaken Liverpool, who had consequently become a club of the past. Coming from Ferguson, the praise was lavish. It was also worth absorbing as the words came from a man who knows a thing or two about gradually building a club back up following a prolonged yet startling descent from grace. This is precisely Klopp’s current assigned mission. In 2014 Liverpool finished second, inspired in the main by the vim of Raheem Sterling, the audacity of Daniel Sturridge and the potency of Luis Suárez. For one season they were an exciting whirling dervish of a team and so nearly grasped that elusive title, but it wasn’t to be. Painfully, aside from that one season, the club has recently been in a quagmire populated by underwhelming sixth, seventh and eighth-placed finishes. Klopp’s mission isn’t to take a hopeful Hail Mary-style running jump at the title, but to nurture his new club back towards a more sustainable version of success, step by step, week by week. Ferguson is confident that Klopp can take those steps with Liverpool, and rightly so. On the evidence of his managerial career thus far, the bespectacled German identifies himself with long-term projects, seemingly bewitched by the notion of achieving resonance of an everlasting state. He was with both Mainz and Dortmund for seven years. Those figures are impressive for a modern-day manager, though use of the word ‘with’ is arguably more important for – unlike other managers – it is never accurate to describe Klopp as being ‘at’ a club, simply because he buys so wholeheartedly into more holistic objectives. He is ‘with’ the team from the start, all the way through to the end. Liverpool have been away for a long time; they have been in need of someone prepared for a struggle, someone with the hunger for an attritional fight to regain ground. Klopp wants to fill that void. The situation he walked into when joining Dortmund was one of rapid decline escalated by financial peril. In 2002, the club won the Bundesliga. But within the year they were unable to pay their players and their home – the Westfalenstadion – had been sold. Bayern Munich helped out by loaning the club €2 million, interest-free. Dortmund teetered on the brink of bankruptcy and slid down the league table. Between 2002 and 2008 the club went from champions to 13th. The conditions were hardly ripe for success; a turnaround would require ingenuity, thrift and teamwork with limited money to spend. Nowadays, Dortmund are a developing European powerhouse. While not at the elite level occupied by the likes of Bayern Munich, Barcelona and Real Madrid, they trail just behind. It’s a long way from where they were eight years ago and much of this is down to Klopp. He instigated a wide scale rejuvenation of the playing squad in his first two seasons while propelling them into the Bundesliga’s top six. His foresight, married with the financial nous of sporting director Michael Zorc, saw Dortmund build through the recruitment and progression of young, relatively inexpensive talent. Neven Subotić followed Klopp from Mainz while youth team products Mario Götze, Marcel Schmelzer and Nuri Şahin were given opportunities. Mats Hummels, unwanted by Bayern, was offered refuge. Polish internationals Łukasz Piszczek and Robert Lewandowski joined for a combined €4.5 million fee. Japanese starlet Shinji Kagawa arrived for €350,000. It was all very modest, under-the-radar stuff, but within a couple of years Klopp had the club working in complete harmony. He had a streamlined, youthful and dynamic team suited to channelling both his emotional investment and the fans’ passion. Tactically, this could be translated as Gegenpressing, a term that Klopp’s Dortmund helped bring into the mainstream. This relentlessly proactive method of winning the ball back as high up the pitch as possible, which was beforehand treated with the disdain and suspicion of all footballing neologisms, was part of the everyday fan’s lexicon by the time Klopp came to English football. So much of the discussion around his appointment concerned the tactic – what it was, what it looked like, how it could be achieved at Liverpool. Through osmosis, Klopp’s vision had become something that could be talked of with unique levels of intricacy. At Dortmund, the football Klopp implemented was fast and vibrant, loud and proud. It was enthralling at its apex, befitting of a club on the rise again. Fascinating as it was to watch, chart and assess, this indefatigable style required a hidden substance, something unseen by the analyst. It needed complete buy-in from all players. That was something Klopp achieved which, in tandem with a devout following that felt less and less disconnected from the players they were roaring on, galvanised an ailing club. It took Dortmund back to the Bundesliga summit, twice, as well as a Champions League final. In forging this connection he made the players’ effort as unconditional as the fans’ support. There was a mutual recognition of the importance of both, a close spiritual alliance between noise levels reached and hard yards ran. 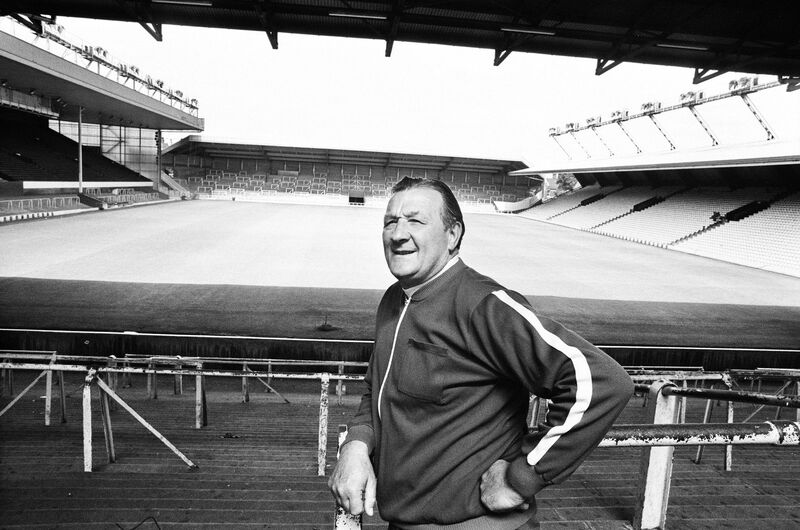 In this respect, his appointment as Liverpool manager ties in with tradition. Liverpool’s history could easily be split into two distinctly separate columns: pre and post-Bill Shankly. A managerial autodidact, Shankly took the reins at the club in late 1959 after working his way up the ladder and sparked a complete shift in English football’s hierarchy with his all-encompassing outlook. He took Liverpool from the Second Division to three First Division championships, as well as two FA Cups and one UEFA Cup. This sleeves-up aesthetic was perhaps more a product of the times than any specific tactical preference though; Shankly was always more perceptive of the bigger picture. His strategic streak led to the creation of an internal club culture. Post-match conversations with Paisley, first-team coach Joe Fagan and other members of staff took place in the boot room, which soon became synonymous with Liverpool. This room acted as the club’s dedicated ideation space, where – often over a beer – the coaching staff discussed everything from football philosophy to individual performances while formulating short and long-term plans. Essentially, Shankly’s vision was one of incorporation. He once famously stated: “At a football club there’s a holy trinity – the players, the manager and the supporters.” He believed these three components were the club’s truest formation. They were ideals that the incumbent Liverpool manager would probably nod his head to. In hiring Klopp, Liverpool brought in a man who, like Shankly, genuinely acknowledges the value of his club’s fans. Furthermore, he shares similarly paternal instincts towards his team. The first thing he did at the end of his opening game in charge – a 0-0 draw with Tottenham – was to hug and cajole his players as they left the pitch. Klopp also shares a history of loyalty, preferring to stick with a tried and tested core throughout his teams. Modern football can at times appear a cold, cynical arena. The distance between today’s incarnation of the sport traversed by Klopp and that which Shankly helped to define is great, and seemingly becomes greater with every passing season. It’s easier than ever to appear out of touch. The prevailing mode of thought now centres on statistics and systems as focus shifts away from unprovable fallacies and moves towards reason. Today’s game is agnostic and the increasing influence of data, science and the overtly evident has in some cases acted as a war on emotion. In the past, team mentality was valid reasoning in the wake of victory or defeat. However that reasoning is now distrusted, mainly due to the simple fact that the linkage between a team’s emotional state and its physical performance is difficult to prove with facts and figures. Resultantly, the idea of an overarching philosophy strung together by positive emotion is considered too abstract, arguably even archaic by modern standards of measurement. But Klopp has never been one to stick with convention. Not only does he feel that emotion matters, he believes it plays an integral part in the teambuilding process. What Klopp brings to Liverpool cannot be processed on a computer, but it does have historic precedent. Shankly changed the course of the club’s trajectory with his ‘Holy Trinity’ and Klopp will utilise a similar ideology. Other managers may first look to the transfer window or the chalkboard but Klopp’s principal aim will be to imbue his team with passion and an emotional connection. This is how he will get his players to run those vital extra kilometres. Klopp is a tactician; he will not neglect the ideas of the present, and rightfully so. But nor will he eschew the abstract or the supposedly archaic. On the contrary, he will embrace it. In doing so, he will attempt to restore a collective ethos of work and perfection that Shankly instilled but has long since been forgotten. Passion and emotional togetherness are principles that few modern English clubs attain or even strive towards, but their importance should not be dismissed. It is Klopp’s ability to harness these principles that offers his team a competitive advantage. In this sense, his appreciation of values so often associated with football’s past could aid him in transforming Liverpool into the Premier League’s club of the future.